Based in the heart of Liverpool city centre, it felt only right that our Warhol floor should feature our very own John Lennon room. Liverpool is renowned for its Fab Four, with many Beatles landmarks visited by tourists all year long. Inspired by Andy Warhol’s iconic Menlove Ave. album cover, this spectacular space encapsulates the creativity of Warhol and Lennon that the world fell in love with. Specialising in group accommodation in Liverpool, this spacious room sleeps up to six guests, featuring multiple deluxe beds and a whirlpool bath to enjoy at your leisure. Whether you’re staying with a larger group of friends or your family, the layout of our rooms provides guests with the perfect blend of social space and privacy. 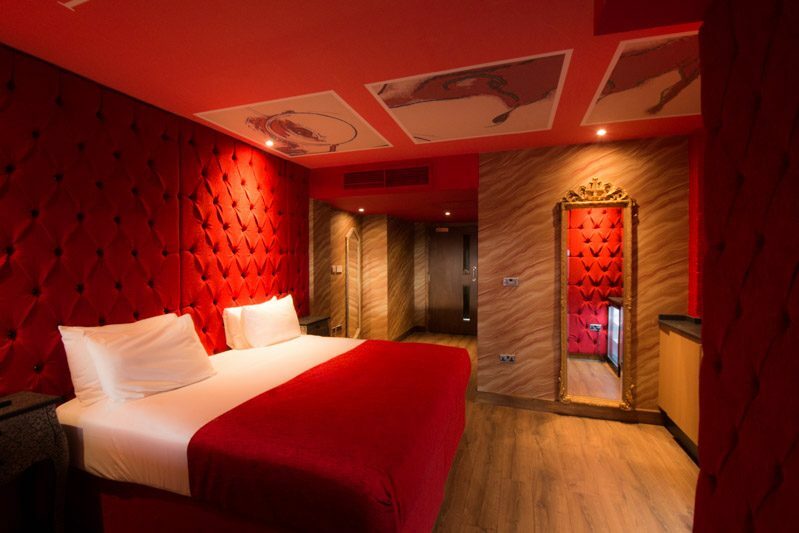 Whether you’re staying in Liverpool to explore the city’s incomparable sights or dynamic nightlife, you’ll find Arthouse Hotel located right in the middle of it all. Liverpool’s leading clubs and quirky independent bars are only seconds away from the hotel, ensuring that your time in Liverpool is spent holding a cocktail instead of a map! John Lennon’s second posthumous release, Menlove Ave. was released in 1986 under the supervision of Lennon’s widow Yoko Ono. With a timeless cover designed by Andy Warhol, Menlove Ave. is easily one of Lennon’s most famous album covers, still held in high esteem by Beatles fans and artists across the world. Andy Warhol was personally asked by friend Yoko Ono to design the LP graphic. With his distinguishable artistic style, Warhol used a photograph of the Beatles legend taken by Iain Macmilan. Most notably, Macmilan was also the man behind the camera when the infamous Abbey Road cover was captured. Liverpool’s very own icon, John Lennon was born in Liverpool on the 9th October 1940. Musically talented from an early age, Lennon’s first band were called The Quarrymen, eventually joined by Paul McCartney and George Harrison. Though they didn’t know it then, the fusion of Lennon and McCartney’s talents would go on to produce some of the world’s most famous and best-loved songs in history. The band changed their name to The Beatles, and with Stuart Sutcliffe on bass and Pete Best on drums, the band enjoyed a period of playing dynamic shows together in Hamburg. After leaving to focus on his painting, Stuart Sutcliffe tragically died, and Pete Best’s role in the band was filled by Ringo Starr. With a new line-up and promising contract with EMI, their local gigs and Liverpool fanbase spiralled into Beatlemania. Nostalgia was a common theme in Lennon’s music. Growing up in the leafy Liverpool suburbs, “Strawberry Fields Forever” was one of multiple songs alluding to Lennon’s sentimental childhood. Menlove Ave. was named after Menlove Avenue in Liverpool. Lennon lived at 251 Menlove Avenue as a child. The scenic street also passes the quaint and charming Woolton Village, where John Lennon and Paul McCartney met for the first time. Speaking about the record, Yoko Ono explained, “What I hear in John’s voice are the roots of the boy who grew up in Liverpool, listening to Greensleeves, BBC Radio and Tessie O’Shea”. Though John and Yoko famously spent much of their time in solitude, Lennon and Ono shared a great friendship with pop art pioneer Andy Warhol, so it’s no surprise that Ono reached out to Warhol following Lennon’s death. Photographs available to the public show the three creative minds enjoying spending time together, suggesting a close and playful friendship developing over the years. When Warhol died in 1987, Yoko Ono was one of the speakers at his funeral. Andy Warhol was born Andrew Warhola on the 6th August 1928. Renowned for his vivid creations and pop art pioneering, the American artist is best known for the cover of Menlove Ave. along with the thought-provoking Marilyn Diptych and Campbell’s Soup Cans. An iconic artist both then and now, Warhol’s life was far from the norm. The artist’s New York studio The Factory was a go-to venue for people of all backgrounds. Gatherings saw drag queens, playwrights, Bohemian street people, intellectuals and Hollywood celebrities united under one roof. The artist famously managed the rock band The Velvet Underground, channelled his creativity into writing with several books and lived proudly as a gay man prior to the gay liberation movement, which began in the late 1960s.